I make no secret of the fact that sometimes I’m a lazy daisy, and although I can be a lazy daisy, I don’t cook a lot of processed, convenience foods. I’m not saying I never use processed foods, just not often; sometimes a girl's gotta have her KD…just keepin' it real! I feel that it is important to eat real food, but I do have short cuts, things that I do to make cooking a good healthy dinner more simple. One of my favorite shortcuts is to cook a big batch of something, and use it in two different dinners. For example; a couple of nights before I had made a big batch of lentils for this salad, not having any idea of what I would make with the leftovers, but knowing that lentils are very versatile and can be reheated, or eaten cold. And then the night before making Indian Cauliflower Fried Rice I made a big batch of rice for dinner with the intention of making fried rice the next evening. 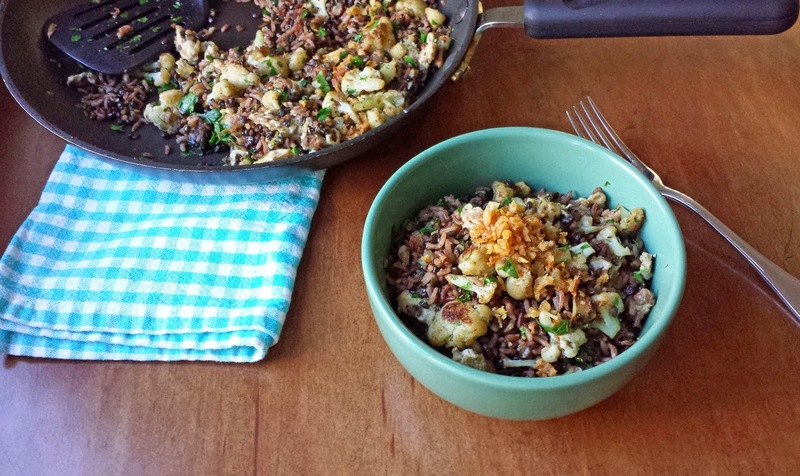 Because it utilizes leftovers, Indian Cauliflower Fried Rice goes together in just minutes. This dish is super healthy and can stand alone as a meal, but it also makes a delicious side dish to serve with lamb, chicken or beef. Fragrant spices perfume the dish, but are not over powering, so that the whole family will enjoy this dish. Truth is that I looove Indian food, and Billy won’t even try it, and while I don’t think that Indian Cauliflower Fried Rice is an authentic Indian dish, I am thinking that by introducing Billy to Indian ingredients and spices in dishes that are more familiar to him I’ll eventually get him to try some authentic Indian dishes; I know that once he tries it he’ll love it too! So I guess what we’ve discovered is that I’m not only lazy, but also sneaky…a girl’s gotta do what a girl’s gotta do! 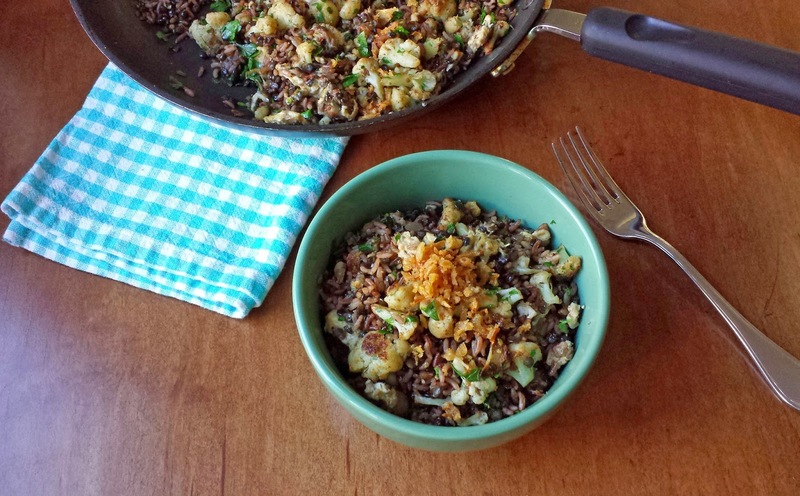 The trick to fried rice is to use leftover cooked rice, any kind of rice that you have, except par boiled rice. This happens to be pink rice which we had for dinner the night before, it has a very slight cinnamon flavor and is higher in minerals than white rice. I also had leftover cooked black lentils from a couple of nights before, but use what ever kind of lentils that you have. Start by heating some grape seed oil over medium-high heat and then stir fry some cauliflower which has been seasoned with a pinch of salt. When the cauliflower is golden brown, add the shallot, garlic, cumin, coriander, thyme, and cayenne pepper; cook until the shallot is soft. Stir in the rice and lentils; cook and stir for a couple of minutes, just until the rice has a little color. Stir in a little soy sauce, I prefer low-sodium. The addition of a couple of slightly beaten eggs is optional. This is the lazy daisy way to do it: push the ingredients in the pan to the outside exposing the bottom of the pan in the center and pour the eggs into the center. Stir the eggs, keeping them in the well, until the eggs are cooked. Then stir the eggs in and add a quite a bit of chopped parsley. If you like garnish with some fried onions (I buy the ones that come in a container at Ikea). You may also fry some more shallots being sure to get them really crisp. The garnish isn’t necessary, but it does make the dish mighty tasty! 1. Heat the grape seed oil in a large skillet (non-stick works well) over medium-high heat. Add the cauliflower with a pinch of salt, cook, stirring frequently until the cauliflower is golden brown, (3 to 5 minutes). Stir in the shallot, garlic, cumin, coriander, thyme, and cayenne pepper, cook until the shallot is soft (less than a minute). Add the rice and lentils, stir and cook until they are heated through and the rice has just a little color on it, 2 to 3 minutes. Stir in the soy sauce. 2. Make a well in the center of the rice mixture, exposing the bottom of the skillet. Pour the beaten eggs into the well, and stir them as you would scrambled eggs until they’re cooked. Now work the eggs completely in with the rice mixture along with the parsley. Remove from the heat and transfer to a serving dish, or dishes, and garnish with the fried onions. Looks and sounds like a wonderful, tasty dish and a great ideas left overs. 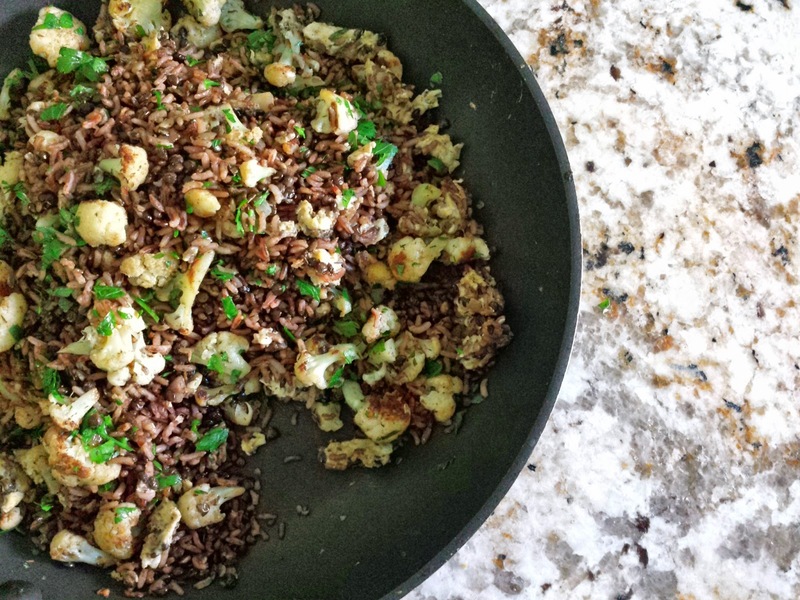 Coliflower is one of my favorite veggies and combines so well with rice. I love fried rice! This looks super, Kari. I love the addition of black lentils.